Many of you are familiar with Breakfast with Nick, the fantastic blog Nick Dekker has been doing as a hobby since 2007. Since it’s start, he has reviewed over 60 of Columbus’ breakfast and brunch spots and has reviewed another 50 around the country. Documenting his favorite meal has led to recognition in Columbus and more when he was featured in a national documentary titled Breakfast Special by PBS and produced by Rick Sebak in 2010. On the documentary, Nick was featured with Skillet and The Best Breakfast & Sandwiches. 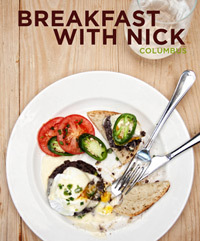 Nick is working with Robin Oatts, photographer and designer of Genre Creative to research, write, and publish a guidebook to breakfast in Columbus, titled Breakfast With Nick: Columbus. What will the book contain? The book will be published on November 5, 2011. Breakfast With Nick will kick off the book’s publication with a release party that evening at the North Market Dispatch Kitchen. Attendees will get to sample some of the featured restaurants’ food, meet the book’s collaborators, and interact with some of Columbus’ most well-known foodies. The book (cover design is still being finalized) will retail at $15 per copy. Copies will be available on Nick’s website, and at selected locations around Columbus. We need backers to help us fund the first printing of the book. Essentially, by backing this project you are pre-ordering your copy of the book. To show our gratitude, you’ll get a bonus breakfast-themed notebook (to record your own breakfast adventures!) and a special thanks in the book itself. This is in addition to your copy of the book, of course. All of the funds will go toward paying for the first printing. The Kickstarter will run through October 4, 2011 at 11:59pm. Below is a Q&A with Nick about his writing, what you can find in the book and his favorite stand-by spots. Anne: Why a book? Has it been a dream of yours to be a published author? Nick: The book will be paperback, perfect bound. We’re publishing it ourselves. I’ve taken care of the writing and research, my wife Beth handled organization and marketing, and our friend Robin Oatts (photographer/designer of Genre Creative) is doing the complete design and photography. We’re getting it printed locally, although we haven’t decided on a printer yet. Yes, I’ve always wanted to be, and have been, a writer. I’ve been writing in general for a long time, starting with the standard angsty high school poetry phase. But throughout college and graduate school I wrote a few plays and have published some scholarly articles. My undergrad degrees are in English and Communications, and my Master’s and Ph.D. (from Ohio State) are in Theatre History & Dramatic Literature. It’s a bit of an odd mix of things, but I’ve always been writing, so starting the breakfast blog in 2007 was a natural extension of me wanting to document my experiences. I’ve always wanted to publish something more substantial, and the full idea for a book on breakfast took shape about a year ago. As I discovered more and more of Columbus’ breakfast scene, I realized that there were great stories to tell. With all of the national attention our food scene has been getting, I wanted to do my part and highlight our great breakfast stops. I’m also trying to combat Columbus’ tendency to vote Bob Evans as our best breakfast. It’s good, but nowhere near our best. Anne: When did you decide you were going to write a book? Nick: We really decided to move ahead with the book last fall. We had some conversations with Lori Gum of Periodisa Publishing, and she was very encouraging. Due to the nature of the book, she encouraged us to self publish; her advice and assistance solidified our desire to do the book, and she’s been an invaluable help throughout the process. Once we got a sense of all of the steps involved, from photography to writing to marketing, we realized that we could do it. Especially once we had Robin on board; we didn’t want to do the book unless we got to work with her. Anne: How do you envision people using the book? Nick: We tried to write and photograph the book in way so that it’s appealing and helpful to both Columbus residents and visitors. When writing about the featured restaurants (there are about 30 total), I tried to imagine a visitor to Columbus picking up the book and reading through it, so I geared the features toward helping them get to know the restaurant and want to try it. At the same time, the restaurant owners and managers shared some great stories with us, so we hope that a longtime customer of a particular restaurant will learn something new about their favorite place, such as how it started, or why, or who’s working behind the counter, or why certain dishes are on the menu. The book will serve as a daily reference, too. We did full features on about 30 restaurants, but we’ve listed every place we could find (not counting the chain restaurants), and there are close to 200. So if you find yourself in a certain part of town, you could open the book to that section and find a full listing (with descriptions and basic info) of the breakfast joints in that area. Anne: What’s next for you? Will you continue with breakfasts or will you move on to a different mealtime? Nick: I’ll definitely keep writing about breakfast. There are still a lot of places to explore in Columbus, and new ones opening every month, so the blog will continue full force. I’m still writing for (614) Magazine, too, so you can expect to see more articles there. We’re keeping ourselves open, in the future, to doing more books about breakfast in other parts of the country. I’ve batted around the idea to writing a breakfast guide about western Michigan, where I grew up. Anne: Do you have benchmark meal? Nick: I usually use one of three benchmarks to judge a place. One is to just order the straight up eggs, bacon, potatoes, and toast. If a breakfast place can’t get those right, they’re in trouble. And right away that tells you how they can cook eggs, do they prepare the bacon well (and can you order it more or less crispy), what type of potatoes they offer (homefries, hash browns, etc), and the quality of their bread (is it just cheap white bread thrown in a toaster, or something they bake on premises, etc.) The second way is to order an eggs benedict, which is my favorite dish. There are many variations on it, so trying a restaurant’s take on it tells you a lot about the place. The third way is to ask a server what the restaurant is known for. Trying out one of their signature dishes gives you a good feel for a restaurant. Anne: How many times will you visit a place before you give it the final verdict? Nick: I typically write about a place after one visit, but I’m always up for a re-visit. I also try not to review a new restaurant within two weeks of opening. I’m definitely aware of the fact that a blog post is simply a description of my one experience there, but it’s very rare that I find a restaurant I’m not willing to return to, even if I didn’t like a particular dish or had bad service. Anne: Do you feel like you’ve hit all of the places in Columbus? Nick: Not even close! In fact, writing the book has only enlarged my list of places to visit. We listed every unique breakfast place we could find in the book, but I didn’t have time to visit and eat at every single one of them. I’ve been to a lot of places, but a portion of the book “research” was done over the phone or by having others do some field research for me. In some ways, I feel like I’m only getting started. Anne: What have been the most fun and most challenging parts of compiling information for your book and how does it compare to doing the same for your blog? Nick: It’s been a lot of fun working on this project with my wife and with Robin, but one of the true joys is meeting all of these small business owners. This type of writing is much more complex than the blog, because it’s focused on telling the story of the restaurant and not just describing what I thought of the food. It’s amazing to meet so many of these owners, many of whom have put in an incredible amount of work to make Columbus’ restaurant scene so vibrant. There’s story after story of these owners following their passion; they knew it wasn’t a glamourous profession, but they had always wanted to open their own donut shop or small diner or cafe or teahouse. It’s also great to see how many family operations there are, either multiple generations running a restaurant, or husbands/wives, parents/children working together. The biggest challenge was just tracking down and organizing all of the information. Some restaurants have great websites, Facebook pages, Twitter feeds, but some are almost completely off the grid. So we definitely spent some mornings just driving around certain areas of town, double-checking menus, chatting with owners, or even just confirming some restaurants’ existence. Even now, we’re going to keep updating the information in the book until the very last minute. Restaurants open and close, or renovate, or change their menus. So the tough part is just keeping up with all of it. Anne: Is this still your ideal breakfast? Click here to view it. Nick: Yes, although this list is always changing. I just use this list as a fun way to keep track of some my ultimate favorites. Anne: What are your current top 5 Columbus breakfast places? Nick: It really depends what I’m in the mood for, but these are five of my stand-bys: Starliner Diner, The Best Breakfast & Sandwiches, Buckeye Donuts, Katalina’s Cafe Corner, and anything Kitchen Little prepares. Anne: What will be different about your book that would make a regular reader of your blog want to own it? 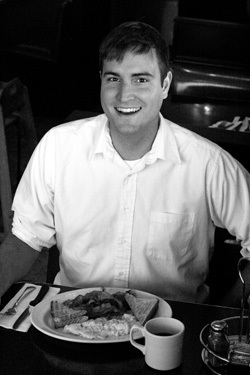 Nick: The blog is focused more on my personal experiences and thoughts at different establishments. We decided to distinguish the book from that format by focusing more on the stories of the different restaurants. So the book is based on my knowledge of the breakfast scene, but it’s intended more as a comprehensive guide than a journal of my experiences. Also, the blog just uses pictures I take with my camera, while the book features Robin’s photography, and she’s simply amazing. I’d never be able to photograph breakfast as well as she can. Robin geared her pictures towards showing these restaurants in a new way, so again, regular customers to a restaurant will get to see their favorite breakfast places in a brand new light. Anne: And one more – would you rather have breakfast or brunch? Nick: I love brunch, but I almost always prefer breakfast. I’m one of those morning people, so I’m typically up early and ready to eat. Congratulations to Nick and his team!